Over time, many homeowners become “real estate challenged” and find that their home doesn’t provide room for everything in their busy lives. With the high cost of property in the Bay Area, the thought of moving to a larger residence is frequently discarded in favor of remodeling an existing home to maximize its potential space. Beyond obvious living space though, people often forget that every attic, crawlspace, closet, nook and cranny holds potential for creative storage solutions. Professional design/builders are experts in identifying and exploiting unused spaces for higher capacity storage throughout the home. These days, kitchens contain much more than a fridge, a range, dishes and cookware. As the social center of most homes, kitchens today accommodate a number of conveniences – multiple appliances, specialty cookware, pull-out bins for trash and recycling, homes with fold-down computers, spacious pantries, laundry appliances and display shelves, to name just a few. It’s easy to see that the heart of every home needs to face many challenges with clever design in order to keep pace with today’s busy family. In a remodeling project completed by our company, the original kitchen was woefully lacking in storage. There were no cupboards on the walls and only a few base cabinets among them, several were useless and inaccessible corner cabinets that hid hard-to-reach and, thus, forgotten cookware. 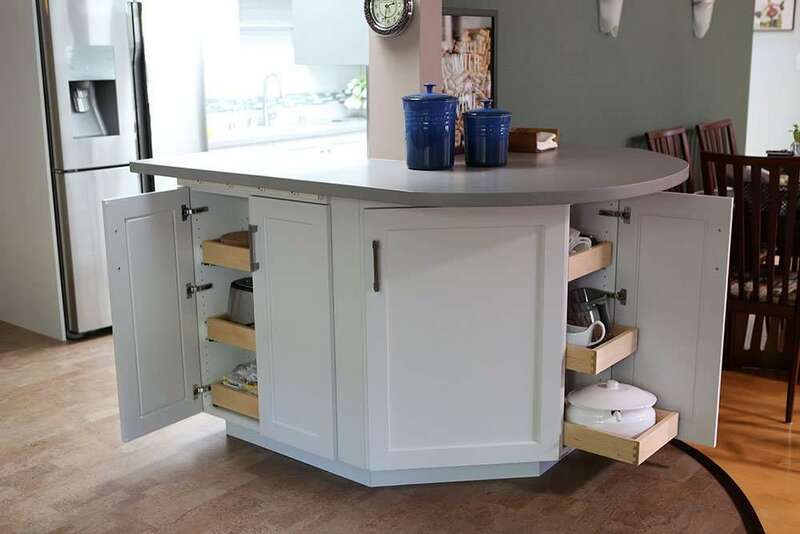 Additionally, a center island housed a sink and dishwasher but provided little counter space for the large area it occupied. Determined to find more room for the family, Harrell Remodeling designers created a kitchen layout that makes food preparation a breeze. Cookware, utensils and pantry goods are now conveniently accessed in the numerous cabinets, drawers and pullouts. A generous, sweeping peninsula provides plenty of counter space and enables the homeowners to prepare meals together while visiting with their guests. Ironically, the new peninsula layout created the possibility of a dead, unusable space in the sleek new walnut buffet, but the designer was not deterred. Instead, an ingenious pullout wine cabinet was installed to make use of the 30-degree angle created by the new peninsula. In another kitchen located in Los Altos, a leak above the kitchen inspired the client to correct an inefficient room layout and improve storage in every available corner. With little room to spare, every precious square inch was carefully considered for function and storage in this redesigned kitchen. The cramped under-stair storage area was opened up to the room, creating space for the owner’s new rustic table. The walls in the alcove were lined with shallow shelving for practical storage and display of collectibles. The existing stacked washer and dryer now reside in custom built-in cabinetry that cleverly conceals the appliances behind new flipper doors. The space now has a more open and organized feel to it that is brought together by the seamless blending of the warm, distressed-finish cabinets throughout the kitchen. In Portola Valley, a homeowner needed a solution for their laundry area. The original location was adjacent to their living room and they needed to find a more appropriate place for their noisy laundry. After careful scrutiny of the upstairs spaces, a wonderful solution was found. An existing hall closet and the attic storage area located behind it were combined to create a spacious laundry room. Now suitably located near the second floor bedrooms, this small feat was achieved with only a modest amount of structural work. And, to ensure everyone’s comfort, sound isolation detailing and vibration specialty work was integrated to limit appliance noise and vibration from impacting family members in the adjacent rooms. Outfitted with crisp, white cabinetry, every compartment in this tidy area was detailed to the homeowners’ needs. Plenty of hamper baskets kept sorted laundry handy. Spacious countertops and a fold-down ironing board got clean clothes organized in a snap. A new skylight combined with a colorful (and quiet) floor made this a very cheerful and well-illuminated room! medicine cabinets with electrical outlets (for razors and toothbrushes), and plenty of drawers for toiletries. Bedrooms and family rooms can also be designed for maximum efficiency to store just about anything. Details often include customized clothing storage (adjustable hanging roods, bins and trays, shoe shelves, tie racks, pull-out roods for garment bags and dry cleaning), dressing areas, entertainment systems and library shelving. Thoughtful storage solutions can make the most of any space. One lovelyPortolaValleyhome lacked a playroom for the children and needed a guest bedroom for the frequent out-of-town family guests. Searching the home, the large unused attic above the garage provided the perfect solution to both space problems at once. The generously vaulted room has plenty of space for the homeowner’s three children to read, play games, do homework and run around. A built-in desk, a TV cabinet and abundant storage systems house the many books, toys, games and videos for the children, as well as the linens (for the new full bath) and space for guest’s personal effects. Displaying a chameleon charm, when company arrives, it easily transforms from a playroom into a luxurious guest suite. Visitors will find a comfortable room with plenty of natural lighting, a generous seating area, and a pull-down Murphy bed hidden inside the wall storage system and a desk area. Imaginative storage solutions can be created in every home. Even the smallest of houses have hidden space that can be better exploited so that the home will function more efficiently for the family. So think bigger, get outside of your obvious floor plan area, and get into storage.